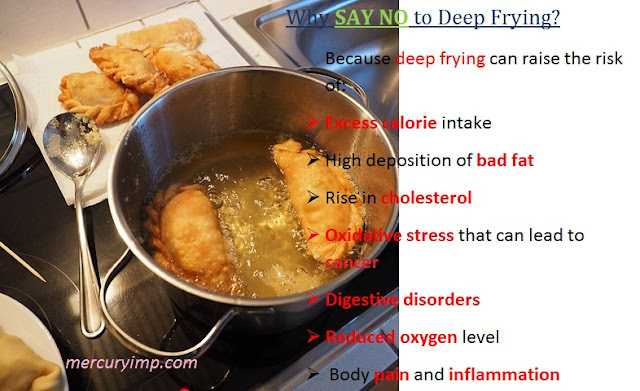 Why SAY NO to Deep Frying? Deep fried food is high in trans fat and calories. When foods are deeply fried, they lose moisture and absorb fat from oil. 1 tsp of oil has almost 40 calories. Imagine the amount of calories you take in when you fry food in oil. When you eat deep-fried food, you tend to raise the risk of trans fats in your body. When a food item is deeply fried, the chemical structure of oil changes. As a result, it gets difficult for your body to break down such fats. This puts you at high risk of fat accumulation in the body, further increasing the risk of obesity, heart disease, cardiovascular disease, cancer, and diabetes. If you choose to re-heat oil, you are only adding up the trans fat content. According to a study, when oil is re-used for frying, there is excess nutrient loss. Acrylamide is a toxic substance that is found in deep-fried foods as a result of heating oil at high-temperature. This includes heating food in any form, including roasting, frying, and baking. So what oil is healthy for baking, frying, and roasting? Extra virgin olive oil comprises monounsaturated fats, which are relatively stable at high temperatures. Even avocado oil shares similar properties. Frying foods in an air fryer is healthier option as hot air is responsible for cooking the ingredients. As a result, foods end up crispy outside and moist inside.